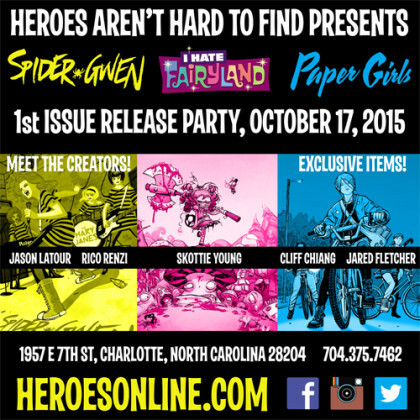 THE HEROESONLINE BLOG | Paper Girls #1 Spider Gwen #1 I Hate Fairyland #1 Release Party :: THIS SATURDAY! Paper Girls #1 Spider Gwen #1 I Hate Fairyland #1 Release Party :: THIS SATURDAY! Join us Saturday, October 17th a for signing of epic proportion! Save the date, more details coming soon including exclusives, hours and more! Skottie Young wil be joining us to celebrate the release of I Hate Fairyland #1! Paper Girls colorist Matt Wilson has cancelled his appearance at this signing for personal reasons. Thanks for your understanding.